Worcestershire are facing a tricky chase in their County Championship match at Southampton after Hampshire built a sizeable second-innings lead. Having bowled out the visitors for 211 in their first innings, Hampshire closed on 163-8, a lead of 242. 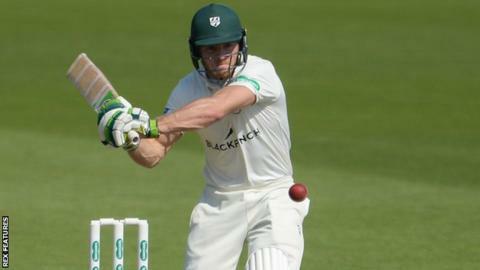 Worcestershire had slumped from 40-2 to 127-7, before Ben Cox (65) and Ed Barnard (40) earned a batting point. Hashim Amla made 36 for the second time in the match before he was run out late on to still give Worcestershire hope. The South Africa batsman was at the crease for more than two hours, but was dismissed by Tom Fell’s direct hit while attempting a quick single shortly before stumps. Hampshire seemed certain for a much bigger first-innings advantage than 79 before wicketkeeper Cox and all-rounder Barnard put on 76 for the eighth wicket. Brad Wheal eventually removed Cox, caught at square leg, and captain Joe Leach in consecutive overs to wrap up the innings quickly. Batsmen continued to struggle in Hampshire’s second innings as Worcestershire’s pacemen shared the wickets around. After his first-innings 75, England number three Vince was out for 12. But, with only three half-centuries in the match so far, Hampshire may already have enough runs to defend. “There is still plenty in the wicket when you get it in the right areas. It is tough. We could have bowled them out for less but then we finished them off quickly when we got that breakthrough. “As a batter there is a fine line out there between being aggressive, which you can be rewarded for, and being patient. Wickets can fall quickly out there. “It has been a roller-coaster. It has fluctuated from one way to another. This morning it looked like we were in trouble and could have followed on. “But then there was a fantastic partnership between Coxy and Barny. We got back in the game and then they got off to a flier but then we have done really well in the last 30 overs.